Many people rely on general dentistry services to preserve oral health, along with restorative dentistry treatments to repair dental damage. However, many patients don’t have a good idea of exactly how dental services and oral hygiene habits contribute to the health and strength of their teeth. To clearly understand how best to protect the teeth, it is important to understand the main components of a tooth’s structure. Here, Dr. Kenneth W. Coffey discusses the anatomy of a tooth, and offers our Orland Park, IL patients tips on how to maintain good oral health. At the foundation of each tooth is the tooth’s roots. Tooth roots start at the base of the tooth and extend down into the gum line and jawbone. Tooth roots play a vital role in the health and structure of the mouth. Every time a person bites down, the tooth roots absorb the shock of the bite; this is what stimulates the tissues of the jaw to continue to generate new, healthy tissues. If a tooth is lost, and the roots are no longer there to stimulate the jaw, degeneration can occur. Since the roots are hidden beneath the gum line, they are protected by several layers of tooth structure. It is important to maintain strong, healthy teeth so that the root structure is not compromised. The pulp of the tooth exists in the center of the tooth structure. This soft, living material contains a collection of nerves and blood vessels. 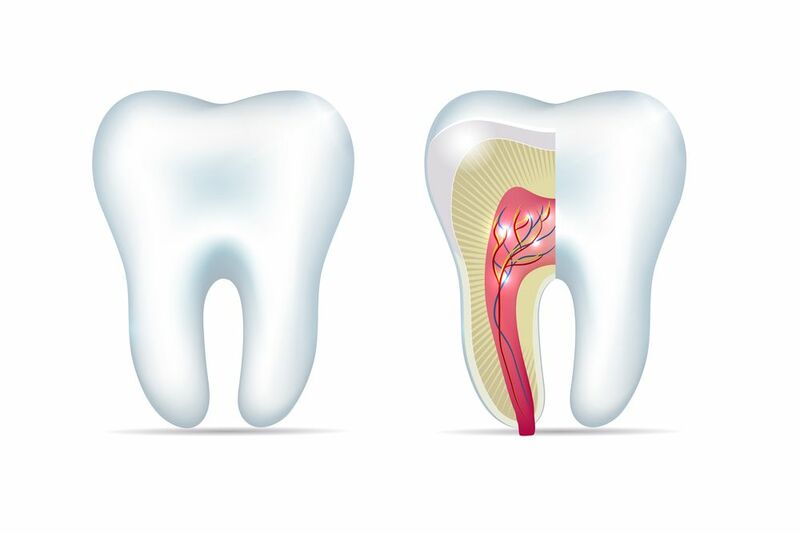 The pulp connects to the roots of the tooth, with nerves extending into the root canals (tunnels that run through the roots of a tooth). Tooth pulp is highly sensitive and can become inflamed and infected if it is exposed to bacteria. Like the roots of a tooth, the pulp is surrounded by protective layers of tooth structure. However, if the outer tooth becomes compromised, patients may develop oral health complications, such as a root canal infection and tooth sensitivity. Dentin is a hard material that surrounds the pulp of a tooth. Although dentin is strong, it is not as durable as tooth enamel. Additionally, dentin contains microscopic tubes that are essentially small paths to the pulp of the tooth. If the dentin is exposed, these tubes can introduce bacteria to the pulp of the tooth. Heat and cold can also reach the center of the tooth through these microscopic tubes, which greatly increases tooth sensitivity. Tooth enamel is the hardest part of the tooth. It is the outermost layer of the tooth and provides protection to all of the tooth’s inner layers. Enamel is strong enough to withstand the force of regular biting and chewing. Tooth enamel does not contain any nerves, so it does not react to hot and cold temperatures. The strength of tooth enamel is what allows the teeth to perform daily functions. Unfortunately, although enamel is strong, it can become damaged or wear down over time. When tooth enamel is damaged, it exposes the dentin, which then leaves the pulp and roots of the tooth vulnerable. To avoid serious dental complications, it is important to repair any damaged tooth enamel as soon as possible. Restorative dentistry treatments such as fillings and dental crowns rebuild the outer layer of the tooth to restore a protective shield around its inner layers. Professional dental care allows us to maintain, or restore, the structure of the tooth so that serious dental problems do not develop. If you are concerned about the health of your teeth and would like to learn more about the comprehensive range of dental services offered by Dr. Kenneth W. Coffey, contact us at your earliest convenience.